It’s just not spring in my home and garden without serving up the Betty Salad Recipe. In today’s post I share that recipe. The dressing is super easy to make from scratch. Below is the recipe my mother in law gave me years ago. However, please note that this dressing is found in most of the grocery stores in the Midwest these days. Wash the spinach and sprouts. Gently toss the sliced eggs and crumbled bacon into the garden fresh veggies just before serving. Mix the above ingredients together and refrigerate for at least an hour before serving. I got this recipe from my mother in law years ago. It’s just not spring without Betty….. I hope you start inviting Betty to your spring celebrations or give this wonderful recipe a try this spring during the busy garden seasons because it is super easy to make. 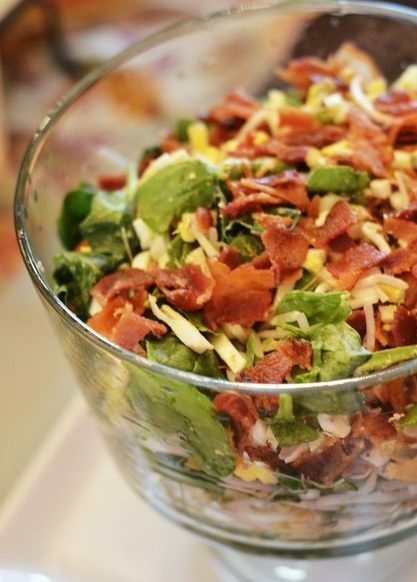 Betty Salad became a family tradition shortly after I got married almost 20 years ago when my mother in law shared with me how easy it was to make the dressing from scratch. We use to have brunch up at The French Quarters after church from time to time and this salad was always on the buffet. Today you can purchase Betty Salad dressing at the local grocery store. The salad was originally from Timko Soup & Such restaurant which was was located on the northwest corner of Sylvania & Douglas in Toledo Ohio. 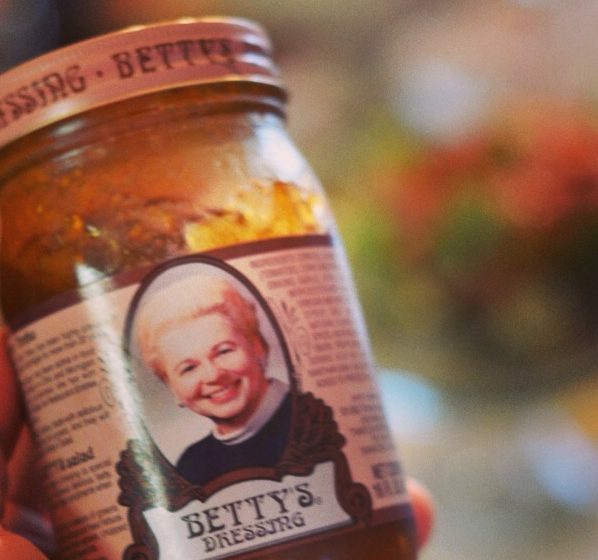 Not long after Betty Timko died the restaurant closed, but her salad dressing is still produced and sold in jars at food stores. Find out more about Betty and her Family at The Blade / A family tradition. Have you ever heard of Betty Timko before this blog post? Do you have a favorite seasonal tradition recipe? I would love to hear from you so be sure to comment below or send me a message on social media. Yum, yum, yum! Thanks for posting this! anytime Elena … thank you for commenting on my share! PUlled Pork BBQ : I’m totally trying this dressing on mine next time. Thank you for the tip 2LadiesintheKitchen! This sounds like my mom’s spinach salad and yes, it’s VERY good! It’s my favorite salad of all time!! I guess good ol’ Betty started serving this recipe up at French Quarters Perrysburg in the early 60’s. It’s super yummy – thank you for stopping by Kylee! I used to go to Timko’s Soups n’ Such restaurant just for their Betty Salad — yummmmo! I’m definitely going to make this soon — thanks for sharing the recipe! Thank you for continuing this wonderful hometown salad. In my younger days I remember going to Betty Timko’s Soup and Such Restaurant at the corner of Sylvania and Douglas seeing Miss Betty making her rounds visiting at everyone’s table. Toledo has so much history contributing to the food world! I’ll be serving this Friday night to my son and his wife when they come home for his CCHS reunion.